The need for concealment strikes at the heart of intelligence and covert operations work, as well as a number of military activities. Concealment devices have been used to disguise film, documents, and other items containing intelligence material, which of necessity must be transported from a dangerous location—in or around the spot where they were gathered—to a safe haven, namely the intelligence bureau that commissioned the activity. To achieve the objective of circumventing detection, intelligence agencies and operatives have developed a number of clever devices, ranging from hollow coins to fake batteries. Documents, cameras, and film had found secure hiding places in objects as innocuous as a statuette, a hairbrush, or a can of shaving cream. All forms of concealment devices rely on the use of camouflage in the most general sense of the term. The word, from the French camoufleur ("to disguise"), entered the English language during World War I, when the development of military aircraft exposed troop positions to enemy reconnaissance planes. In the course of the war, all major military forces established camouflage units composed of soldiers trained in the art. This led to the development of camouflage uniforms, the use of foliage or other materials to disguise positions, and other measures. Nature, of course, "discovered" camouflage long before humans did, and in a wide variety of plant and animal species, natural selection has favored those that developed protective coloration or other forms of natural camouflage. Concealment by camouflage, in its truest sense, is of necessity passive rather than active, and in this regard, the term does not encompass those species capable of imitating predators or otherwise "convincing" other plants or animals that they are something other than they are. This point is an important one, because it is not the purpose of camouflage and concealment to persuade the enemy; rather, the purpose of camouflage is to render the enemy unaware. Disinformation, then, is not truly concealment, as its purpose is to convince the enemy that some (actually false) premise is the case. Likewise, codes and ciphers, while they certainly conceal information, are not a form of concealment in this sense because they are obviously codes. Effective concealment necessarily involves items that resemble everyday objects, coins being a good example. During the Cold War, KGB operatives often carried microfilm in a concealment device made from one of the more physically large coins commonly used in the country of their operation. Likewise, a Western intelligence service in the late 1970s used a hollow version of a United States Eisenhower dollar coin. Inside the Soviet version was a cavity for hiding microfilm, which might contain ciphers, messages, or a communiqué providing the operative with date and time coordinates for a planned transmission. A special pin opened the interior. The Western version, in use during the late 1970s, could be opened by pressing the tip of the eagle's wing on the reverse side. Long before the use of coins as concealment devices, intelligence operatives utilized an even more common disk-shaped object of small size: a button. In this case, the button itself was an ordinary one, but the back contained a carefully written coded or enciphered message in very small lettering. This technique dates back to World War I. Concealed weapons that fell into western hands through the defection of Russian Intelligence Captain Nikolai E. Khokhlov in 1954 included cases of cigarettes that fired hollowpoint bullets and miniature pistols that fired while making a sound less than the snap of a finger. items. When West German operatives of the counterintelligence service BfV apprehended one East German spy, they found in his apartment a decorative wooden carving of an elk. Inside the base, however, was a compartment for holding a Minox camera, a favorite piece of photographic equipment on both sides of the iron curtain. One reason for the Minox's popularity was its size and shape, which was oblong and flat, and therefore made for easy concealment. Another East German favorite was a men's clothing brush or shoe brush, which could easily hold a Minox in the handle. Locking pins kept the compartment from opening when the operative was using the brush for its intended purpose, as he would most certainly have done so as not to arouse suspicion. A particularly inventive East German device made use of a portable chessboard whose surface had sockets to secure the playing pieces. One of the 64 sockets, when a paper clip was inserted into it, opened the back of the chessboard to reveal a microdot camera. The chessboard—which, like many of these items, was probably one of a kind, created in a special East German workshop for espionage equipment. Security of intelligence operations required that no device become standard equipment; if one operative were detected, this could potentially blow the cover of other comrades using a similar item. Film and other items. Cylindrical objects make a logical hiding place for rolls of film, and agencies of the Communist world used a number of such objects. One was a D-sized battery, about as large as a typical photographic film canister. So as to avoid suspicions arising from a nonworking battery, inside the fake one was a much smaller battery, about the size of an AA, which provided voltage. This left the remainder of the inner compartment free to conceal any item small enough to fit. 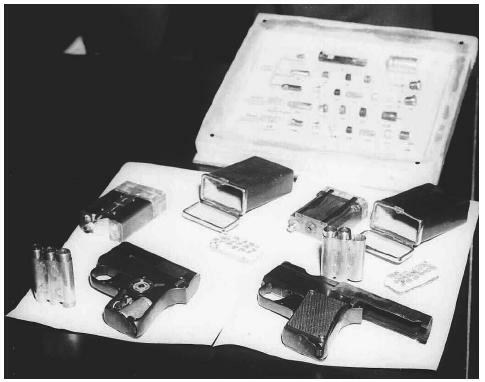 For the same reason that the fake battery was made to work like a real one, a shaving-cream can device used by Western intelligence contained a small amount of shaving cream, with the remainder of the compartment set aside for concealed items. A cigarette used by Polish intelligence likewise had real tobacco, but the operative would never knowingly light it: inside was a roll of extremely thin film. On the other hand, a soap case used by Czech intelligence to transport film did not have room for a real soap bar: inside was a battery and flashbulb, which would flash and ruin the film if it were opened improperly. Breckenridge, Robert P. Modern Camouflage, the New Science of Protective Concealment. New York: Farrar & Rinehart, 1942. Hartcup, Guy. Camouflage: A History of Concealment and Deception in War. New York: Scribner's, 1980. Minnery, John. CIA Catalog of Clandestine Weapons, Tools, and Gadgets. Boulder, CO: Paladin Press, 1990. CIA Museum. Central Intelligence Agency. < http://www.cia.gov/cia/information/artifacts/ > (March 29, 2003). International Spy Museum. < http://www.spymuseum.org/ > (March 29, 2003).